"Thomas forgot the alphabet when he made the ouija board. Somehow, he forgot that V came after U, and instead put B. We laughed quite hard when he announced that he spelled a letter wrong. How do you spell a letter wrong when you’re just writing the alphabet?" Photo from Power Tool Pumpkins. When I recite this quotation, I add a very pregnant pause before the word pumpkins, to build the suspense, and I pronounce pumpkins so as to maximize its spookiness, blowing it up in size with that initial syllabic "pump" of air. It's great fun to utter pumpkin as if it's the vegetable equivalent of the boogey man! With the right intonations (i.e., dead seriousness with an undertone of insanity, like you're "out of your gourd"), the word pumpkin can sound like a curse. Spooky graveyards are so passé -- imagine the terror of having to cross through a frightening pumpkin patch on the way home at midnight! The sound to dread, of course, is the *snap* of the vine (or "tendril," to those initiated), for then the ominous orange fruit with demonic flesh has broken free of its umbilic tie to Hell. (Movie announcer voice:) This Halloween, prepare to get squashed! Or, This Halloween, we're all plucked! Quarter stack photo by Checkered and aMUSEd. [T]he oldest trick in the book is the one where, in a fist fight, you pretend you’re doubled over in pain but really you’re preparing to whip around and blind your enemy with a fistful of dirt. "What's the big idea?" Einstein's theory of relativity (1905) states that energy and mass are equivalent. Oohs and Ahhs and . . . . Ever thought about how "ooh" and "aah" are ubiquitous backing vocal phonemes, but "ayy" and "eee" and short "a" (as in "hat") are rarely if ever heard? If you want to entertain yourself during a commute, try imagining '50s or '60s pop songs with some of these "alternate vowel sound" backing vocals. One particularly appealing image for me is a chorus of Fonzies singing "ayyy"s behind "Don't Worry Baby". Literary humorist Jonathan Caws-Elwitt's plays, stories, essays, letters, parodies, wordplay, witticisms and miscellaneous tomfoolery can be found at Monkeys 1, Typewriters 0. Here you'll encounter frivolous, urbane writings about symbolic yams, pigs in bikinis, donut costumes, vacationing pikas, nonexistent movies, cross-continental peppermills, and other compelling subjects. [I]t’s the oldest trick in the book to produce false testimony and false witnesses. I'm mad at my friend the veterinarian. He only calls me when he's in the doghouse. But I expect to hear from him again in two shakes of a lamb's tail. What about the librarian? Oh, he's in my good books. Did you hear about the filmmaker who went in for Jungian analysis? Yeah, he had some major *projection* issues. Did you hear about the gourmet mystery writer who was surprised to find a spent citrus wedge garnishing his key lime pie? He said: "This is an unexpected twist!" False signaling to a non-existent relief force was the oldest trick in the book. "When will you ever learn?" Babies are born with mute wisdom. Their infant spirits are equipped with awareness and feelings, and they must simply develop in strength and skill. I'm mad at my friend the yoga student. He only calls when he's in over his head. Oldest trick in the book, a limp. Saint Pompa taught her followers to "Raise your eyebrows to Heaven and curl your lips in prayer to the High and Mighty." Famous for wearing very tight-fitting pantaloons and children's footwear (for purposes of mortification), Saint Pompa inspired the phrases "too big for one's britches" and "too big for one's boots." She is perhaps best-remembered for her ecstatic hymn, "La-Di-Da." Did you hear about the wise little bunny they found in the Jewish temple? They named him "Rabbite." Security’s not coming, Susan. We’ve got all the time in the world. . . . Oldest trick in the book. I faked the call. I went to bed feeling haunted by Kurt Vonnegut, whose hateful words echoed in my head: "I have never used semicolons. They don't do anything, don't suggest anything." When I finally fell asleep, I dreamed I was in college. The class was Freshman Composition. No one there knew how to use me. But they liked me. I was mysterious... I looked important and well-educated. They used me over and over again. Yes, I was in all the wrong places. And yes, I would ultimately be circled or crossed out with red ink. But there were so many of me! I was EVERYWHERE! I woke up refreshed. I had glimpsed my own immortality. I'm mad at my friend the astrologer. She only calls me once in a blue moon. the Vanishing Audience, who perhaps escaped through the door marked "Exit"
My father slapped at the air and made a pfft sound. —Claire Messud, The Last Life: A Novel. The "stretch portraits" in the Haunted Mansions of various Disney theme parks tell intriguing stories that most viewers don't have time to decode. As any visitor to the Haunted Mansion will tell you, the portraits grow in length as the ceiling of the gallery appears to stretch upward. The portraits initially tell a three-part story, labeled in our illustration as A, B, and C (top, middle, bottom). However, the story doesn't end there. The viewer's eye must then go back up to A for a macabre and darkly humorous "epilogue." Let's examine each portrait to decode their secrets. On the far right of our illustration is a portrait of a distinguished gentleman with a beard. In section A, we see the man striking a formal pose, one hand on a lapel of his jacket and the other holding a parchment. Section B presents a gag: the man isn't wearing pants! Section C holds a big surprise: not only is the man in his boxer shorts, but he's standing on a keg of dynamite, and a candle has just lit the fuse! But the story doesn't end there. Bringing our eyes back to the top, we see the man in a different light. The man is obviously not surprised that he's standing upon explosives. Indeed, he deliberately posed this way, for the portrait painter! And that paper in his hand? We now realize that he's holding his own suicide note. His face is calm -- he is at peace with his own mortality and is ready to face the great unknown. Now let's look at the portrait to the left of the bearded man. In section A, we see a lovely young lady posing outdoors, holding a parasol. Section B presents a gag: the woman is balanced on a tightrope, and it looks as if the rope might break at any moment! Section C holds a big surprise: not only is the woman precariously balanced, but there is a crocodile below her, hungry jaws open wide! Yet the story doesn't end there. Bringing our eyes back to the top, we see the lady in a new light. She is obviously not surprised that she's standing on a tightrope. (Indeed, she wore pink slippers for the purpose!) Her face is serene -- she is prepared to face the jaws of death, as the painter she hired hurries to finish his portrait! Now let's look at the portrait to the left of the parasol lady. In section A, we see a young businessman wearing a hat, his arms crossed in a posture of self-assuredness. Section B presents a gag: the young man is sitting on the shoulders of an older man! Perhaps he is climbing his way up the corporate ladder? Section C holds a big surprise: the older man is sitting on the shoulders of yet another, and they're all sinking in quicksand! But the story doesn't end there. Bringing our eyes back to the top, we see the young man in a different light. He is obviously not surprised that he's sinking in quicksand. Has he struggled his way to the top to save his own life? His calm face and crossed arms point to a different conclusion: he knows he's going down, and he is at peace with his imminent merger with Mother Earth. Finally, let's look at the portrait at the far left of our illustration. In section A, we see an elderly woman wearing a shawl, posing with a red rose. Section B presents a gag: the woman is sitting on a tombstone! Section C holds a big surprise: the tombstone belongs to her husband George, and it appears that he was murdered with an axe to the head! But the story doesn't end there. Bringing our eyes back to the top, we see the woman in a different light. The woman obviously killed her own husband. Indeed, she appears almost proud as she sits atop his grave. But is something else going on? Why is she holding a rose? If it's not for her unloved husband, could it be for herself? Perhaps this portrait could be entitled "Arsenic and Old Lace." The woman's own time has finally come, and she is calmly waiting for the poison to kick in. Looking back at the top of each portrait, we see that the old woman, the businessman, the young lady, and the distinguished gentleman are all (in their own unique ways) "going out on top." The point of all these portraits seems to be that death is inevitable, so why not take it in stride, have a little fun along the way, and go out with bang? It's a darkly humorous philosophy that few guests to the Haunted Mansion have the time to decipher during their brief visit to the gallery. Haunted Mansion portraits from my private collection. We used the oldest ad trick in the book—exaggeration. Here's another mention of a can of yams dating back to the 1970s, still waiting to be opened. The yam-shaped South Pacific island of Ambrym owes its name to Captain Cook, who anchored off there in 1774. Ambrym means “here are yams” (ham rim in Ranon language). A pregnant woman's "Self Portrait as a Yam"
Beware the dragon, lest he eat your yams! A one-act play entitled The Can of Yams was penned by the inimitable Jonathan Caws-Elwitt. Did you hear about the yogi who came out of trance having written an entire holy book? Doubters are calling the whole thing premeditated. I dreamed of "limpid creatures of limitless tact and tenderness who would discuss with me a semicolon as if it were a point of honor—which, indeed, a point of art often is," just as in THE FOREST FOR THE TREES by Betsy Lerner. Then, in a state of half-sleep, I assembled a "mutual appreciation" list: Madeleine "I Love Semicolons" L'Engle, Anne Frank, John "We Love Semicolons for Tightness, Terseness, and Fast Pace" McPhee, Jorge Luis Borges, Walt Whitman. 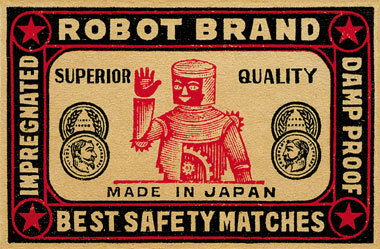 Why not light a robot candle with robot safety matches? Sandman is an 850-lb fire shooting performance robot. Christian Ristow's robots destroy each other with fire on a regular basis. The oldest trick in the world: evolution! Saint Deluda oversees motion picture sequels, sofa beds, films adapted from novels, pot luck dinners, the third album released by any pop band, blind dates, the middle child, customer service, "the first time," Disney's California Adventure theme park, and mung beans. Threshold is door, and it has a double significance: border and crossing over. It indicates where one thing ends and another begins. The border which marks the end of the old makes possible entry into the new. ... Threshold is not, however, only borderline; it is also crossing over. One can step over it into the adjacent room, or, standing on it, receive him who comes from the other side. It is something that unites, a place of contact and encounter. Doorway to The Universe, located within the Hayu Marca mountain region of southern Peru and about 35 Km from Puno, has long been revered by local Indians as the "Place of the Gods"
The Traditional House Under Threat? Did you hear the one I just made up about the Shroud of Tourette? This unholy relic doesn't depict a face as such -- more a defacement, with a slew of crude French words that, in their time, would have been considered rather obscene.